Facts and figures related to the software as a service (SaaS), on-demand, hosted delivery and cloud computing CRM software market. A Datamonitor research report titled Selecting an On-Demand CRM Vendor forecast double digit compound annual growth for cloud CRM software of 17.4% through 2013. According to analyst firm IDC, the 2012 CRM software market was about $18 billion, while analyst firm Gartner reports it was about $11 billion. The findings for each firm count similar elements, including SaaS subscriptions, licensed revenues and maintenance fees, but where they differ most is what they call “Customer Relationship Management” and where they source data. 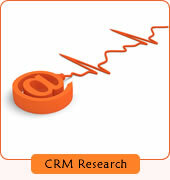 IDC reports the CRM software market grew about 12% in 2012, to approximately $18 billion in global revenues. This continues a slow but steady year over year growth rate, from 11.2 percent in 2011 and 6.2 percent in 2010, according to IDC’s Worldwide CRM Applications Tracker. This also compares well to the global IT spend of 6 percent in 2012, which was down slightly from 7 percent in 2011, also reported by IDC. IDC also reports that the three CRM software sectors of sales, marketing and customer support achieved a combined growth rate of just over 12 percent, while the call/contact center software market continued to experience low single-digit growth. Although the call/contact center market is forecast to achieve a positive growth rate over the 2012-2016 period, IDC advises that the trend of losing market share is also predicted to continue, with contact center business systems expected to lose an additional 3.4 percent through 2016. Analyst firm Gartner reports that the core CRM software market exceeded $12 billion in 2012, attributing about 44 percent of that figure to Sales Force Automation (SFA), 21 percent to marketing automation and 35 percent to customer service and support. Unlike IDC, Gartner doesn’t separate its measurement of customer service and support applications. Gartner also suggests the total revenue mix among CRM applications is both expanding and fluctuating. Traditional CRM, social CRM and analytics are steadily being reallocated from a 90%/9%/1% split at the turn of the century to a 70%/20%/10% distribution near the end of this year. A McKinsey survey among Service & Support Professionals Association members discovered that the proportion of CIOs considering SaaS software procurement jumped from 38 percent to 61 percent. A research report issued by McKinsey & Co and the Sandhill Group found that software-as-a-service (SaaS) and service-oriented architectures (SOA) are the two most important trends in the software industry. A survey among 850 enterprise companies revealed that 74% of respondents were “favorably disposed” towards adopting SaaS solutions, with companies currently spending 19% of their software budgets on subscription-based and on-demand solutions. The report commented that “For vendors, this is a strong indication that there is a clear opportunity even at the largest prospects for those that can offer the right product in combination with the right selling strategy.” The report also added that “nearly every company – or division of a larger enterprise – is a customer or a prospect for SaaS platforms”. In an interesting merging of the industry's top two disruptive platforms, the study also forecasted that while SaaS and SOA were currently on parallel development paths, “we expect them to converge in the future”, paving the way for a “tremendous battle between the largest software vendors and the newer SaaS providers”. The SaaS Customer Relationship Management market in Asia, excluding Japan, will grow at a compound annual growth rate of 61 percent, according to a study by Springboard Research. Australia, Singapore, Hong Kong, Korea, India and China are the key SaaS CRM markets in Asia Pacific, the report finds. Of these, Australia remains the top market, accounting for 35 percent of all SaaS CRM sales generated in the region. “SaaS CRM has gained acceptance in Asia’s business mainstream and the coming year will see higher adoption rates as larger enterprises opt for SaaS CRM,” said Balaka Baruah Aggarwal, Senior Manager for Emerging Software for Springboard Research. “At the same time, the market is set to witness unprecedented growth in the SME sector as a spate of new initiatives by vendors such as SAP, Microsoft, and Oracle increase their marketing activities. Springboard currently estimates that SaaS CRM represents the largest segment of SaaS application expenditures in Asia at 45 percent, followed by collaboration, ERP/PLM/SCM applications, and human resource applications. “Springboard Research believes that a substantial portion of the growth in Asia Pacific’s SaaS CRM market will come from the SME segment. We expect SMEs in Asia Pacific to go for simpler CRM solutions that are not too complex,” said Aggarwal. While the CRM software market is a mature industry, plenty of upside remains. In a study by Forrester, 55 percent of 455 large companies surveyed in Europe and North America have implemented CRM software—a strikingly low figure considering that market sector—and the adoption figure declines much further among the SMB market. When considering the CRM market as a whole, a study by Computer Economics found that 36 percent of all organizations had CRM software in place in 2009, and that figure increased to 51% in 2011. A research report by the analysts at Tier 1 Research finds that while the traditional, on-premise CRM software market has reached relative maturity and is expected to incur a 6.2 percent annual growth rate, the on-demand CRM software market is expected to grow at a 41 percent compound annual growth rate. The research reports indicates that since software as a service (SaaS) “can be a cost-effective delivery method for software functionality, it is rapidly gaining acceptance.” According to Tier 1, SaaS adoption in the CRM industry spearheads other SaaS software industries. T1R researchers highlighted that growth from European enterprises will be driven by the demand for point software applications as opposed to enterprise wide, more integrated business systems. Also, unlike the U.S. and Europe, many larger Asian enterprises have not yet adopted a CRM platform -- either on-premise or on-demand. “The on-demand value proposition will be much more compelling for larger organizations in Asia,” the report’s authors project, adding that as a result, analysts expect larger enterprises to lead the way in terms of on-demand adoption, with smaller companies following suit 12-18 months later.